Full disclosure: I'm new to surfing. Living in land-locked states my entire life didn't exactly open doors to the world of ocean sports, but I've always dreamed of surfing. I skateboarded throughout my teenage years and was frustrated every winter because we had no indoor skateparks, no un-cindered/unsalted roads, and no mountains to snowboard. All fun stopped over winter, and the only thing you could do was play Tony Hawk's Pro Skater or lust over snow/skate/surf magazines. Fast forward 10 years, while shooting the Topa Topa issue in Southern California. I surfed my first wave in Ventura and caught the bug. The biggest thing that surprised me about surfing is that it actually gets better in the winter months—and in some places, like the Great Lakes, begins! Off-shore winter storms bring swells to beaches that are non existent in warm summer months. Because of this places like Maine, Nova Scoctia, British Columbia, and Alaska begin their surf season in the chilly winter months. It may sound crazy to some, but don't knock it 'til you try it. Heading into my first winter of surfing I've been doing a lot of research on what my kit will look like. After a lot of research, testing, and asking questions to those way better than myself, here is what I am packing in my gearbox. DO NOT SKIMP! Invest in quality, and don't be afraid of a high price tag. A 4-millimeter wetsuit will be perfectly fine for most waters during the winter months. It is amazing how warm you will be once you get in the water, so don't stand around too long! Our Pick: Patagonia R4 Front-Zip Hooded Full Wetsuit. Made for frigid waters (38-49º F/3-9º C). Extremities freeze fastest. Depending on the temperatures you are surfing will decide whether 4mm or 5mm would be ideal for you, but if you only wear boots and gloves in the winter I recommend getting the warmest you can. There is nothing that will end a surf session quicker than cold hands and feet, and as you can imagine thats what always gets cold first! Tip: shove a couple hand warmers in your mitts and boots on your way to surf. By the time you put them on they will be toasty warm! OUR PICK: Patagonia R5 Round Toe Booties. You gotta keep your board from getting dinged up. Whether you are carrying in on your roof in backseat, get yourself a good board bag for protection against the elements and clumsy cold fingers. Our Pick: Sticky Bumps Board Bags. I live in on the road, which means I don't have extra space for anything. A rooftop surfboard rack is essentail. My board has been shoved in my truck cap for long enough, I am tire of sand and water getting all over the rest of my gear. This winter, I am getting a rack to keep my board out of the way for good! 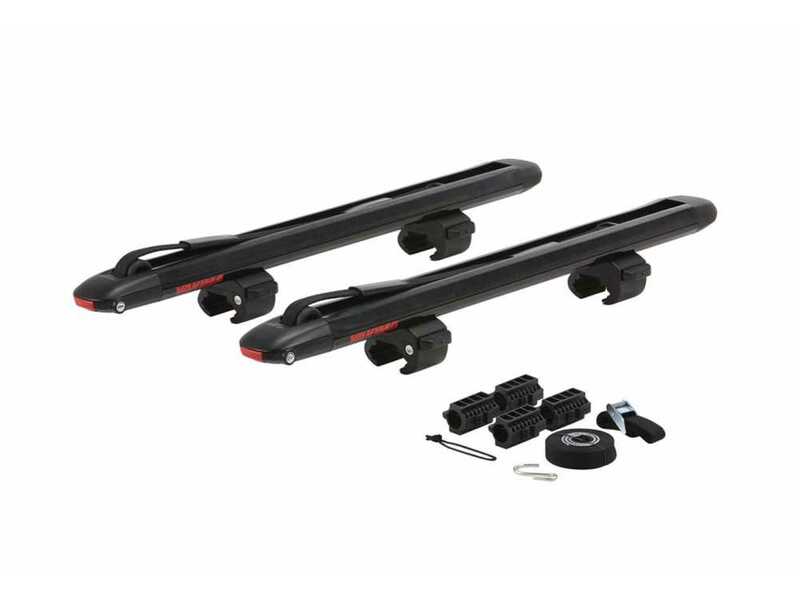 OUR PICK: Yakima SUPDAWG roof rack.